Veteran singer Anton Jones unlike most other singers sang ballads in his singing career of over five decades, also releasing around 35 cassettes. Anton was born on June 3, 1937 at Hulftsdorp, Colombo. His fathers name was Percy and his mother was Jane. He had his education at St. Sebastians English Mixed School, in Hulftsdorp and joined in 1959 as an English stenographer with famous legal firm Julius and Creasy . In 1963 he joined the Bank of Ceylon in similar capacity and served there till he retired on June 3, 1997. His first radio programme was in 1958 at the Sri Lanka Broadcasting Corporation (Radio Ceylon). Asked why he decided to sing ballads he said he wanted to be different from the other singers. He often sang of meaningful historical events which were welcomed by his fans. Many were those who learnt about historical events through his songs. He is thankful to an uncle of his, V. V. Kerner, a renowned violinist who was a back up artiste to the famous Wally Bastians, the pioneer of baila in Sri Lanka. Anton also sang as a back up artiste to Wally Bastian in shows and concerts organised by the renowned Sri Lankan showman the late Donavan Andree. 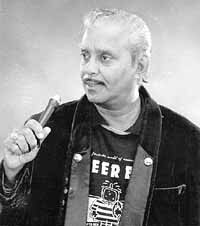 He recorded his first four songs on a 45 RPM EP under the Philips label for the Gowri Corporation owned by Patric Corea, which also included the famous item Mini Gowma (Mini skirt). He rose in the popularity pole in the 70s and 80s with his ballads both locally and internationally. Some of the songs of his which turned to be all time hits - Premawathi Manamperi a beauty queen brutally killed during the 1971 insurgency, Aasai bayayi - the tragic boat accident in river Nilwala, D.C.- 8 plane crash in 1974 on December 4th on the Knuckles range (Seven Virgins mountain range) bordering Maskeliya, Podi Wije - a notorious robber in Polonnaruwa, Sepala Ekanayaka - who hijacked a plane in the mid 80s, Kandy Perahera - about the tragic incident which cost several lives when the Maligawa tusker ran amok, Maru Sira - another notorious gangster who was sentenced to gallows, Saman Kumara - who was abducted and murdered in the Rs. 5 lakhs ransom case, The Four lakhs robbery at the Ceylon Turf Club, Eric Batcho - who murdered Marlene Ludowyke in the early 50s, Mighty cyclone of 1978 which devastated part of the eastern province, AIDS killer - a song about AIDS and Hollywoods film star Rock Hudson in mid 80s. Beside his ballads he also sang humour songs about those who wasted their time neglecting their official duties and gossiping instead. He also sang songs such as Komala papa in the film "Ohoma Hondada" directed by S. Selvarathnam which also featured vocalist and veteran comedian Freddie Silva. He also sang songs about historical places such as Sigiriya (Segiri giri sikaraya) and about Mt. Lavinia beach, Galkisse mudu werale. Anton is married to Iris Jones and is the father of four children Tyronne, Roshan, Roshini and Priyanka. His two sons are in France for the past 15 years while his daughters are happily married. When asked about his famous music directors he said they were Ernest Soyza, Stanley Peris and Priya Sooriyasena. When asked about the recognition given by the print media to local artistes, he said that it was okay to some extent. Anton is one artiste who doesnt believe in cheap publicity and could be named as a veteran who gained recognition as a common vocalist. As a veteran in the local music scene for almost six decades, he criticised the Sri Lanka Broadcasting Corporation (SLBC) and the Sri Lanka Rupavahini Corporation (SLRC) for not giving due recognition to local veterans in the Sri Lankan music scene. He said though he had sung for almost six decades the SLBC only featured regularly songs of a few artistes without airing any of the new creations he had released on behalf of his fans. That was also the fate of all veterans including Nihal Nelson. He remembered the SLRC recording two of his songs in the early 80s one dedicated to St. Anthony while the other was the accident on the river Nilwala (Asai bayayi) over the "Nandana Vindana" musical programme which the SLRC started in the early 80s. In October 2001 he was invited for a 15 minute programme in the SLRC studios and the producers of the programme had searched for a video clip of his to put it on air as an introduction to the programme. He had reminded the producers of the said two songs and their reply had shocked Anton. The so called producers had said that the video clips has been destroyed by fungus. If the authorities, he said, are blind eyed over these kinds of situation the question arises who takes responsibility about destroying the countrys national resources. He praised the former authorities who stared Independent Television Network (ITN) for preserving and maintaining a proper library of the local artistes. He was particular that at least now to the existing video clips of the artistes will be preserved. His latest release will be the song about the terrorist attack on the American W.T.C. Anton has travelled worldwide and visited London, France (twice), Italy, Canada, Japan, Lebanon (twice), Kuwait (twice), UAE (six times), Qatar and Bahrain (twice). His recent tours were in February 2002 to Korea and Cyprus. He expressed his hopes over the recently established welfare association for local aristes known as Outstanding Songs Creators Association (OSCA) under the patronage of Jayantha Dharmadasa.